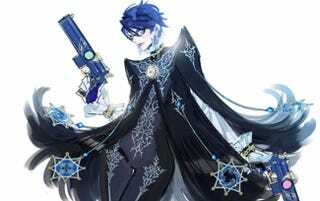 "Bayonetta's not the kind of girl who'd show up with the same hairstyle for her sequel", writes artist Mari Shimazaki. "A girl can be known to change her hairstyle depending on her mood, so I guess Bayonetta was in the mood for something short." Shimazaki, who designed Bayonetta in the first place (and has also worked on Okami), has posted a number of images of her work - along with commentary - for the sequel on the Platinum Games blog. It's a rare treat; normally stuff like this only comes along after a game comes out.